In November 2014 an East Sussex-based rock salt/grit supplier was looking to reduce their Google Adwords spend and invest in SEO to achieve greater organic traffic. They were spending a large amount during the winter months to appear on page one in the Google ads portion of the SERPs to make up for their lack of organic visibility for important keywords. Over a period of time this approach can prove unsustainable and lead many a business to look into the possibilities of SEO. The winter of 2014 was delayed, so although approaching SEO in November was quite late, I was relatively confident that I could take the site up a notch with a burst of SEO work in time for the cold snap where they would make their majority of business. 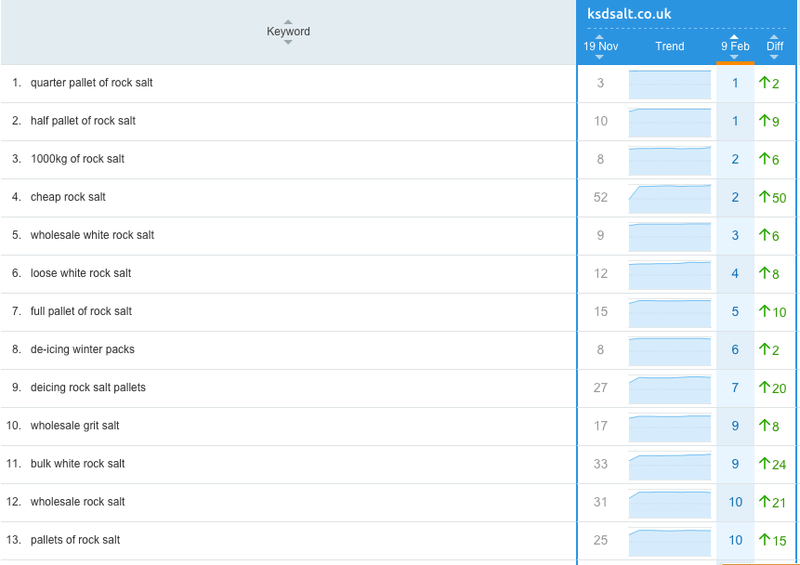 I tracked a variety of keywords on November 19th 2014 so we could gauge how much the SEO work impacted the KPI of rankings. 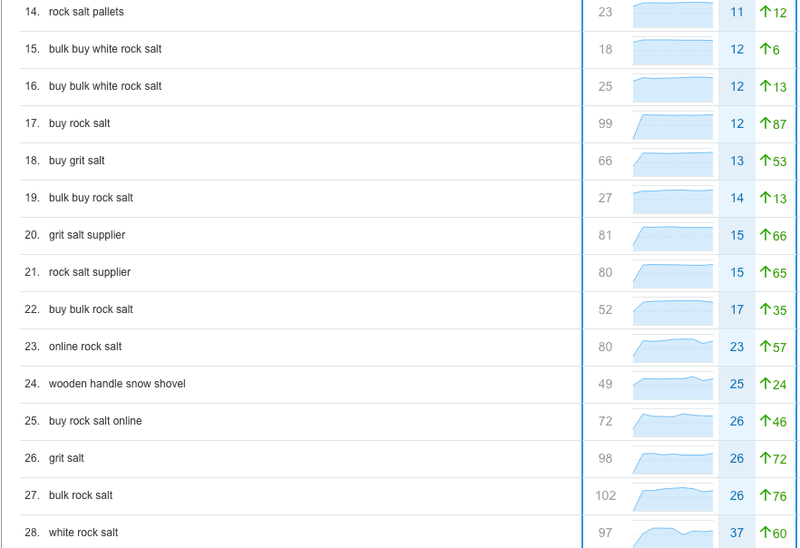 As you can see there have been some huge leaps in keyword ranking position such as ‘cheap rock salt’ climbing from position 52 to 2! Needless to say, this SEO work has really helped the company gain organic presence and reap the rewards of free traffic and lots of new clients! For every issue found in the technical SEO audit there needs to be a solution. Every issue and solution needed to be carefully documented so I could hand it over to the web developer to implement, as well as be able to easily describe the issue and solution to the client. I had to discover all of the links pointing the client’s site and analyse the quality of the linking site. I had to then compile a list of sites that are not linking in a ‘safe’ way and essentially report this to Google through the Google Disavow tool. This takes a very good understanding of backlinks and the Google guidelines, as to ensure only bad links are reported and good links are kept intact. Check out the full range of SEO services we can offer you.